Aunt Eleanor came over an hour or so before we left for Ohio. She had presents for the kids and for us. Thanks so much Aunt Eleanor! We love you! And we'll miss our North Carolina Harty family. We had so much fun on our trip out there this year! From church on Sunday, to playing games, to newsletters, to cleaning churches, to shopping at Wal-mart, to playing with the neighbors, to visiting with family we haven't seen in 20 years, to laughing so hard it hurt, the trip was a huge SUCCESS!!! 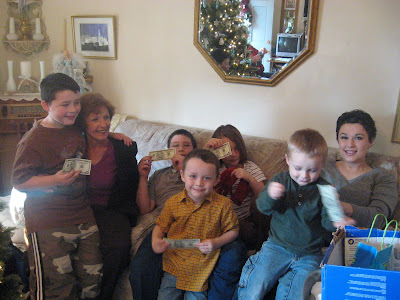 The Harty kids with their $5 from Eleanor. Thanks! Paul with his 'lovely' Santa from Eleanor. 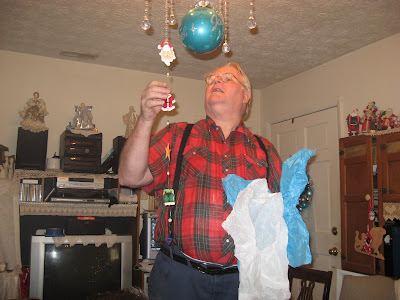 Each year, she works hard to find him a 'silly' Santa for his collection. He collects nice Santas, and Eleanor takes great joy in finding him one that almost fits his definition of 'nice', but not quite! Good job this year, Eleanor! 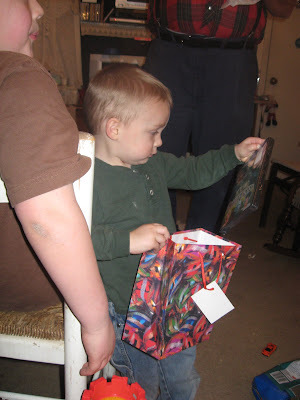 And here's Jimmy opening the present to the Harty (NC) family from Eleanor. It's a DVD, Young Frankenstein. 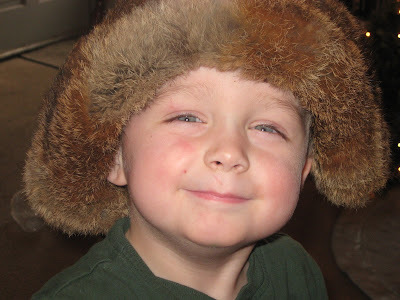 And here's Jimmy in the fuzzy furry hat. I think they called it a TOOK, but I can't quite remember if that is right or not. Isn't he adorable! 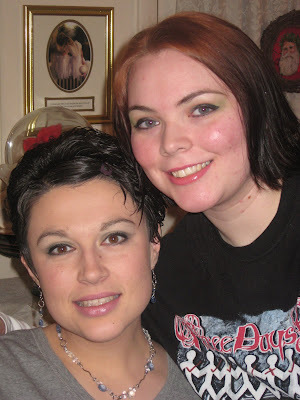 And here's a nice pic of Adrienne and I. Don't you just love the earrings and necklace that Eleanor gave to me! I do love jewelry! I think it's spelled tuque. Haha. Yeah, well, that's not exactly a common word for us American types anyway. At any rate, he looked pretty stylin' in that hat. It looks like you had a wonderful Christmas! It is good to see family and it is nice to be home again too! Happy New Year!